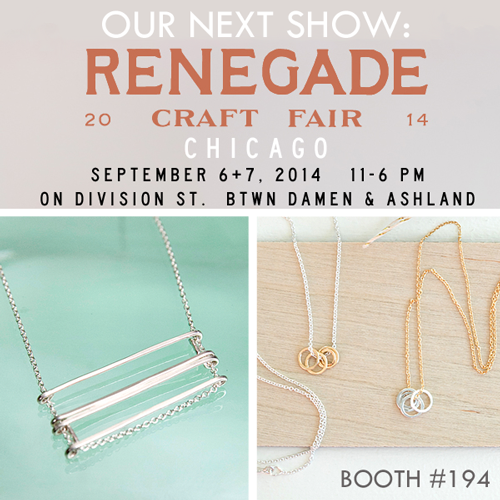 Renegade Craft Fair - here we come! I can't even begin to explain what it's like to be a vendor at the Renegade Craft Fair. It is viewed as the very pinnacle of indie craft fairs to independent makers like myself. It is the biggest, the hippest, the most inventive, and it's in one of my favorite cities, Chicago. It is at the top of the wish-list-shows of makers across the country. Indie crafters say they feel like "they've made it" when they are juried into this show and I can't blame them. Just look at the talent that will be lined up on the street in little white tents! So cheers to you, Chicago and Renegade Craft fans - we'll be driving your way in just a few short days. In the meantime I'll be holed up in my studio getting ready!